This is the tenth installment of a position-by-position preview of the 2019 NFL Draft. Cornerback has a fairly long history of being seen as one of the safer ways to go in the first round. It doesn’t offer nearly the splash of quarterback or wide receiver or edge rusher. But the people who do the drafting for NFL teams have tended to find comfort in selecting someone who can be the antidote to big pass plays, every bit as much as a stud defensive end or outside linebacker. Consider that, in each of the past nine years, a cornerback has been selected within the first 12 picks. Whether that streak extends to a 10th year is debatable, with some draft analysts calling it unlikely. There also are questions as to whether the three-year streak of at least four cornerbacks being taken in the first round will stay alive. “It could happen again this season, but some of those picks will be reaches,” NFL Media draft analyst Lance Zierlein writes for NFL.com. 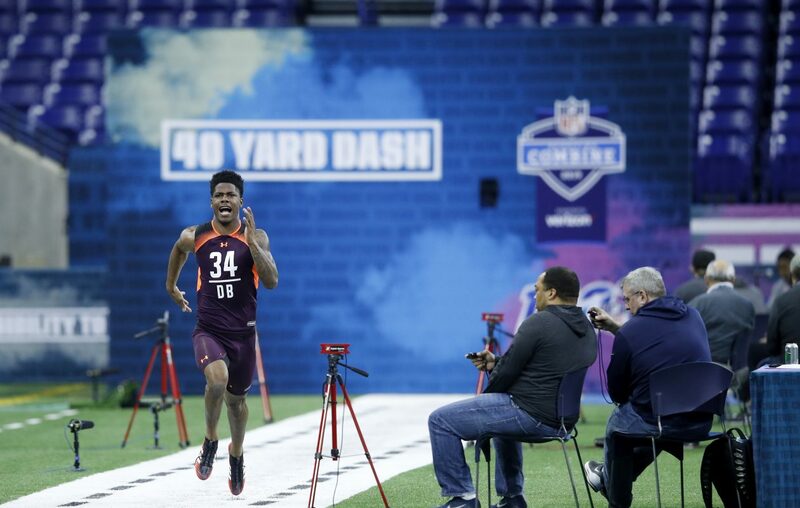 Still, a decent case can be made that at least three players at the position – LSU’s Greedy Williams, Georgia’s Deandre Baker and Washington’s Byron Murphy — have a chance to be chosen in the first round. Several others have low first-/early second-round grades. If cornerback doesn’t prove to be top-heavy in this draft, it certainly looks to be fairly deep. That could be good news for teams such as the Buffalo Bills, who might not necessarily target a cornerback as a premier pick but would like to do everything possible to enhance the wide-open competition for the No. 2 cornerback job opposite Tre’Davious White. For now, that battle features incumbents Levi Wallace and Taron Johnson, and free-agent signees Kevin Johnson and E.J. Gaines. Zierlein calls it a “bad year” for a team seeking to address a desperate need at cornerback in the draft because there isn’t a dominant player there as there is at other spots, such as edge rusher and defensive tackle. Overall grade for the position: B-. The Best: Greedy Williams, LSU. This is hardly a consensus. Equally strong arguments are made for Deandre Baker of Georgia and Byron Murphy of Washington. But Williams gets the nod here because of his exceptional coverage ability. Bills view: How much does Zierlein’s dire warning for cornerback-needy teams apply to the Bills? Not a ton. Stronger cases can be made for defensive and offensive tackle, positions of greater need for the Bills and those that most draft analysts believe offer far more commensurate value to Buffalo’s ninth overall spot. That doesn’t mean the Bills couldn’t trade down in the first round to choose a cornerback, as they did in landing White in 2017, or pick one up in the second, third or fourth round. More than a few draft analysts strongly believe the wisest place to draft a corner is on Day 2 or 3. Sleeper: Jimmy Moreland, James Madison. He caught the attention of plenty of talent-evaluators with an impressive practice week at the East-West college all-star game. Moreland followed that up by turning heads in workouts before the Senior Bowl. Being 5-10, the minimum most NFL teams require at the position, is a big negative. But Moreland was productive enough in college to show he can overcome them. 1. Greedy Williams*, LSU, 6-2, 185. Excels in press coverage, but also does well in zone and off coverages. His ball skills are superb. Biggest knock is a lack of strength. 2. Deandre Baker, Georgia, 5-11, 193. In 2017, he had four interceptions, but in 2018 he had none. The main reason: opponents stopped throwing at him. Physical in run support. 3. Byron Murphy*, Washington, 5-11, 190. Tremendous quickness. Scouts rave about the way he mirrors receivers on short and long routes. Might need more physical development. 4. Joejuan Williams*, Vanderbilt, 6-4, 211. Offers the kind of size NFL teams prefer in a cornerback. Physical and aggressive in run support. Good ball and man-to-man coverage skills. 5. Rock Ya-Sin, Temple, 6-0, 192. Transferred from Presbyterian after its football program dropped down from FSC to Division II. Better at off than press coverage. 6. Trayvon Mullen*, Clemson, 6-1, 199. Does a good job in zone coverage, making the most of his height and long arms. Teams avoided throwing at him last season. Physical vs. the run. 7. Julian Love*, Notre Dame, 5-11, 195. Best quality is his run support. Doesn’t have tremendous speed and sometimes gives receivers too much room. Good in man and zone coverage. 8. Sean Bunting*, Central Michigan, 6-0, 195. Solid at jamming receivers at the line, which should make slot corner his entry point into the NFL. Needs some developing. 9. Amani Oruwariye, Penn State, 6-2, 205. Scouts like his ball skills and ability to anticipate throws coming his way. They also like his size, but don’t love his relative lack of speed or strength. 10. Justin Layne*, Michigan State, 6-2, 192. Former wide receiver offers good size and ball skills. Physical, but must improve tackling and could be smoother in coverage.